This city was once a happy, peaceful place... until one day, a powerful secret criminal organization took over. This vicious syndicate soon had control of the government and even the police force. The city has become a centre of violence and crime where no-one is safe. Amid this turmoil, a group of determined young police officers has sworn to clean up the city. I just downloaded this based on your review. I was a big Nintendo nut when this game out so I was blinkered to think Final Fight was the greatest game ever! I have now seen the error of my ways, I'm loving this one. I love the Streets of Rage series! Hopefully we will see parts two and three for the VC as well. OMG!! HAPPY DAYS!! Would be even happier if it comes out in the U.K, which Im sure it will its, just taking its time about it! I loved this game back in the days and although I do prefer 2, this ones still good! This better come to the uk soon! I have 800 points waiting for this bad boy for weeks! its out now in UK. Again i stress that i own this game 3 times already. 1 mega drive orignal and 2 and 3 PS2 and Gamecube Sonic Gems Collections. Co-Op Mode is the best Period. Arrrrr, it has to be said that SoR has a certain charm about it, regardless of the fact that SoR2 is a better game. Certainly at the time, I was bowled over by how good the original was, it never left my Megadrive cart slot when mates were round, the two player mode was ace! I'd say this is well worth a download, although I won't be myself as I already have the MD version, shipmates. 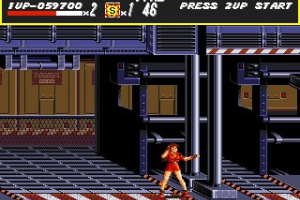 ive seen streets of rage running on the wii and the boarders are reduced and its quicker. not full speed but its not that bad to be honest so some effort is being made. still when i get a wii its a usa one for me. gaz...very unfortunate. Completed this last week in 1p mode...no problems. Has anyone else had the same problem as gaz in 2p? One of the flagship games of the early days of the Megadrive, featuring some great graphics and music for the era. Big sprites, animated backgrounds and wealth of enemies and weapons populate the eight levels of Streets of Rage, Sega's first attempt at capturing the massively popular sideways scrolling beat-em up market. But in 2007, how does the game actually play? Quite badly as a matter of fact. 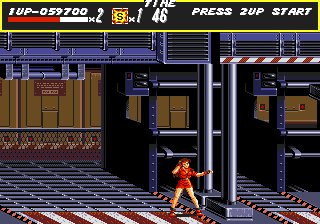 In terms of gameplay I'd argue that it's almost a step backwards from Double Dragon 2 on the NES (the NES version was very different to the arcade original). The combat system doesn't feel as intuitive, the weapons aren't as much fun and the levels are not anywhere near as imaginative as a game released several years earlier for a much more inferior machine. 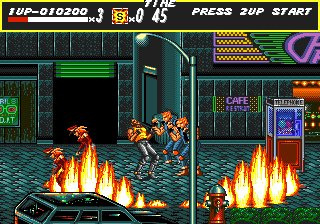 I have to be honest, Streets of Rage is not the game it was when I last played it in 1994. It's rough edges really show through now and it's main selling point at the time, it's presentation is not enough to save it now. It's also way too easy, especially in two-player mode me and my mate cleared the game at the first attempt. 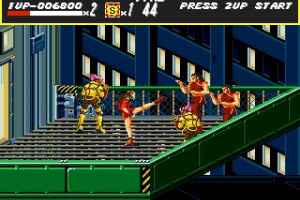 I'd wait for Streets of Rage 2, that was a much better game if my memory serves me correctly. I actually love the special attacks because of their over the top quality, and the soundtrack is my personal fav of the three. I'll give the special attacks credit, they totally ridiculous, especially on the elevator level (stage 6/7?). I just meant the actual weapons you can pick-up are a bit of a disappointment as they all work the same (aside from the tear gas) and there are no real strengths/weaknesses to any of them. You can only use them one way too, which is a missed opportunity. 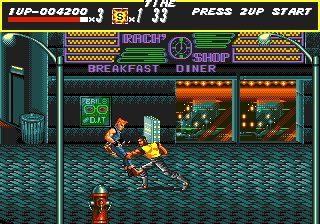 mr64 - How you can compare this to Double Dragon II on the NES is beyond me - SOR is a million times better than that flicker-filled crapfest! The game may be bettered by SoR2, but that doesn't stop it from being excellant. 5* anyday. this was the only game where you can hold the enemy (including most bosses) and have your partner beat the crap out of them using well distanced blows. Ah, yes. 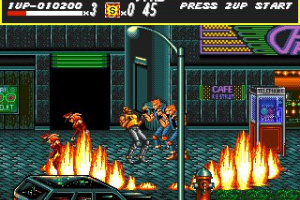 The first Streets of Rage had a two-player mode (not to mention beating up the occasional female fighter) in which the SNES Final Fight lacked. Though it has enough new elements to separate from other FF-style clones. 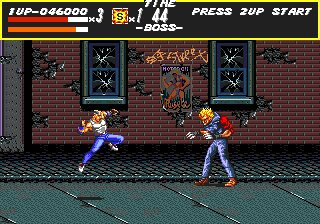 What's also wonderful in this game is the music; Yuzo Koshiro made the soundtrack so memorable as the gameplay itself. 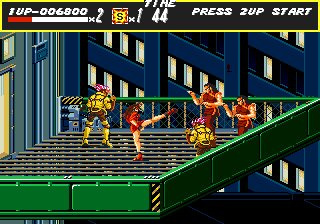 It feels like Revenge of Shinobi under a beat' em up premise (Team Shinobi/Overworks did both games). 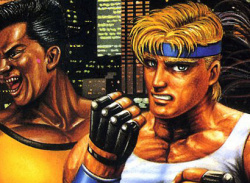 The first game has not aged well as SOR 2, but its charm remains in the hearts of Sega gamers and beat' em up fans alike. 5 stars. Easy. I love this game. I even love my police car driving bazooka firing buddies. (Wave hi fellas!) It's a blatant Final Fight clone, but a brilliant game that brings its own style to the table. Still have really fond memories of me and a buddy taking out the street trash. I really didn't care for the super moves of the sequels though they are both 5 star games that brought something new to the series. Oh and I miss Adam Hunter. Amazing game for its time although I dont think it holds up as well as the 2nd game. I do prefer the soundtrack to the first game out of all 3 which I know alot of people would disagree with. Can I just recommend to everyone that playing this with your mates, a few beers and with Eye of the Tiger playing on your CD player is better than just about anything on VC? Quality. Love this game! This is the first Megadrive game I ever saw and played, I can still remember the awe I felt at the visuals and especially the tunes. I have been a Sega nut ever since. Rock on. Oh well, me and my brother don't play together very much anymore, so maybe I should download this one to bring back the memories and perhaps we could start playing again. 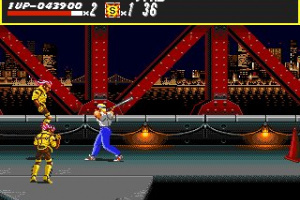 Great game, it is better than Final Fight on SNES as it has two player. Music is fantastic too. It's a brand new game, using sprites from the originals, has new or redone stages, has Adam from SOR1 as a playable character...the list goes on!! Basically it has all the best bits from the originals and more! It's freeware so there is NO excuse!! 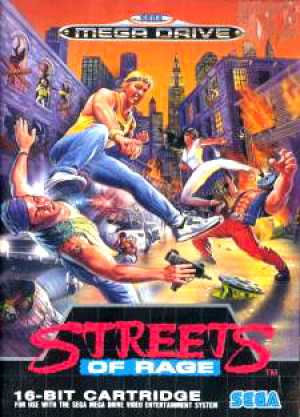 Great game loved it in the 6 in 1 pack on mega drive. Not as good as the 2nd or 3rd Streets of Rage game. But still a good game. Personally, I would give it a 7/10. I never played this game back when it was originally released. My brother told me about this gane so I tried it and love it. When I get more points than I'll download 2 and 3.